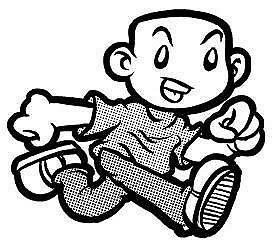 This review originally appeared on Anime Jump in 2003. You never can tell what you're going to find in the children's section. After convincing the girl next door to sell me her Astro Boy LP for $2, I became alerted to the possibilities of finding 60s Japanese animation items on vinyl. So there I was at wax'n'facts, arguably the best record store in Atlanta, incurring the amused glances of hipsters as I pored through their bin of kiddy records. That's where I found the original motion picture soundtrack to Gulliver's Travels Beyond the Moon. This 1965 Toei film was originally titled Gulliver's Space Journey and was directed by Yoshio Kuroda. It was released over here by Walter Reade-Sterling and Continental, two names that have long ceased to mean anything in Hollywood, but which spent the 1960s importing Japanese films (Ghidrah the Three-Headed Monster), British films (This Sporting Life) and fake Cinerama travelogues (Mediterranean Holiday). I can only imagine what it must have been like to see this thing in a theater. I wonder about this mostly because the film was shot in Tohoscope, and no extant licensed copies (in English, anyway) are letterboxed. 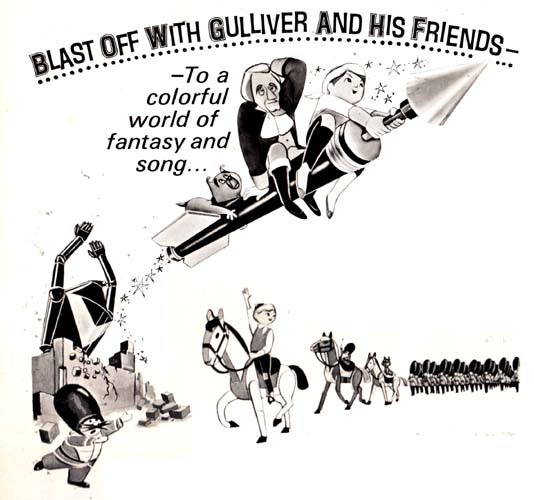 Once relegated to off-air videotapings and bootleg video release, in the early 2000s bargain-bin DVD publisher Catcom released Gulliver's Travels Beyond the Moon on a double-feature DVD with the Dave and Max Fleischer Gulliver's Travels from 1939. Public domain copies of the Fleischer Gulliver's Travels have been clogging retail shelves and thrift store bins for years and years, and for years and years I've looked at every one of them in the hopes that it would be Gulliver's Travels Beyond the Moon instead. Now, thanks to Catcom, I can quit looking. Catcom's DVD release is more or less a digital transfer of the same grey-market print of Gulliver that has been making the rounds on VHS for a few years - faded colors, fuzzy sound, and even a few good old-fashioned drops and calibration errors. What you'll seeing on this DVD isn't very far from the experience I first had when seeing the film on a VHS tape I think I swapped a subtitled copy of Nausicaa for - a fuzzy look at Toei's first excursion into science-fiction animation. Don't let the title fool you. This isn't some tedious literary adaption, like the 1940s Fleischer Gulliver that accompanies our film on this DVD. Gulliver's Travels Beyond the Moon is one of the first entries in a field that would define Japanese animation - children's space adventure. Even so, this is a space cartoon unlike any that came before, and sadly, unlike any that came afterwards. It's dominated by character designs influenced heavily by the experimental eastern European animation of the day, and mechanical designs that are more Museum Of Modern Art than Astounding Science Fiction. There are op-art dream sequences, haunting landscapes reminiscent of Salvador Dali, and legions of abstract robots whose destruction gives new meaning to the term "cubism". Our hero Ricky is a homeless orphan in what appears to be a dilapidated European country, wandering alone and friendless. After meeting a talking dog and a talking toy soldier, they head over to the amusement park for some late-night rollercoaster action. Once the security guards get wise, they chase our heroes to an island, where they find a giant rocket ship commanded by Gulliver of Lilliput fame, who hasn't lost the itch for travel and is now going to outer space. He's headed for the Hope Star, a mysterious planet where dreams come true! Soon our heroes are blasted into outer space, braving zero gravity and mysterious time reversals. But they persevere and soon are approaching the Hope Star. Before they can land, however, a squadron of strange space ships forces our heroes to land on the Hope Star's companion planet, the Blue Star. The strange, Calder-esque beings of the Blue Star are weird-looking, but friendly. They explain that the Hope Star is ruled by robots! Robots that they themselves built! In true pulp-SF fashion, the King explains that years ago the citizens of the Hope Star built robots to fulfill their every need. Soon the people were lazy and had no ambition and just wanted to sit around all day downloading stuff from the Internets. When the robots became intelligent and took over the planet, all the people could do was flee to the Blue Star, where they endure daily flying saucer attacks from the robots. This historical background is explained in a terrifying musical number entitled "Rise Robots Rise", which is as close as anime ever gets to Riefenstahl's Triumph of the Will. Legions of blank-faced, goose-stepping robots conquer the Hope Star, crushing all in their path with mechanical precision. The final touch is the musical score, a surprisingly atonal Moog synthesizer freakout that undoubtedly haunts Keith Emerson's dreams to this day. This is a good spot to mention the film's musical score, by Milton and Anne DeLugg. Mr. DeLugg has written songs for everybody from Perry Como to Frank Sinatra, from Morey Amsterdam to Soupy Sales. He wrote the music and was the bandleader for Chuck Barris's Gong Show. 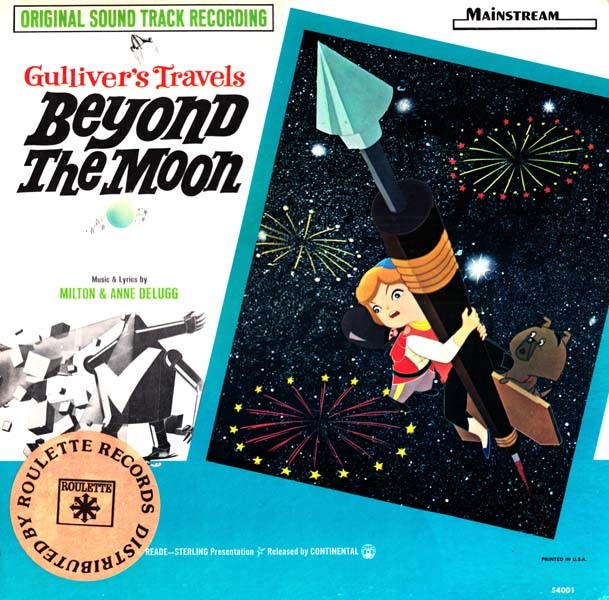 Milton's talent is in full effect here - Gulliver's Travels Beyond the Moon is hands down the best American-made soundtrack to any Japanese animated film ever. Sprightly children's chorus singalongs, jazzy orchestral brass, atmospheric keyboard work - it's all here. Anyway, horrified by the Rising Of The Robots, Ricky and the gang decide that they've got to go to the Hope Star and do battle. Plus, the robots have captured the King's daughter. So it's off to outer space once again. Luckily, life in this region of the universe has one weakness - plain, ordinary water! Upon contact with it, even the robots disintegrate into tiny little cubes! One can imagine Michael Kupperman's comic-strip Picasso screaming I BREAK-A YOU DOWN INTO LEETLE CUBES!! Armed with his water pistol, Ricky's High Noon showdown with the Robot Posse leads to victory! However, the robots have a secret weapon - a GIANT robot, invulnerable to water, controlled by normal-sized robots in the head. Can Ricky defeat this behemoth? What dreadful secret haunts the people of the Blue Star? Don't reveal the shock ending of this picture to your friends!! This is a really entertaining film. Sure, this is a movie about a boy and his talking dog friend and how they go into outer space with a talking crow and a talking toy soldier and Gulliver, and there are countless children's films with plots just as wacky or wackier that in the end are tiresome wastes of time. Not Gulliver's Travels Beyond the Moon. This film is alternatively startling, bizarre, or fun, sometimes all three at once. There are few films, anime or otherwise, that have such a unique and powerful visual sense. The dubbing is peculiar; I don't recognize any of the voices from Fred Ladd's TITRA studio, and a 60s Japanese cartoon without a Peter Fernandez or a Billie Lou Watt is a strange animal indeed. The voice talents are a cast of unknowns (led by a Stephen DeLugg - hmmmm) and are fairly low-key, but directed with the same staccato cadence typical of the voice acting of the period. Catcom's DVD release is of course a mixed bag. I enjoy the double feature motif and I like the extras like cartoons and commercials (the cartoons on this disk are a pair of Fleischer's Gabby cartoons, starring one of the Lilliputians from their Gulliver film, and are uniformly terrible). However, as I said before, the picture quality of Gulliver's Travels Beyond the Moon is on the level of a low-end VHS release. What's more, I hate their menus - select one of two choices, and all that happens is they switch colors. Unless you know which color means "selected", you won't know which one you chose until you're halfway through the opening credits of the Fleisher Gulliver. Catcom, please add a little arrow or something to help your dimmer customers out. In spite of these presentational flaws. this is a film I can't recommend too highly, and should be owned by anyone with an interest in film, visual culture, Japanese animation, or montage sequences about robots conquering entire planets. Even though the DVD is out of print, a little research is all that stops you from joining Gulliver on his trip Beyond The Moon. Say, does that Gulliver's Travels Beyond the Moon soundtrack album have a cut of Rise Robots Rise on it? Is the sound any better then the muddy audio on the Catcom DVD? Also, is the Catcom DVD available anywhere any more? It looks like it's been discontinued and pretty gone from the intra-nets. The soundtrack LP is a real soundtrack from a real record company, it's stereo and everything. Milton DeLugg don't make no junk. I have no idea if the Catcom DVD is still available. Only place I can find the DVD is eBay. It's out of print and hasn't been on the shelves at HalfPrice books since I bought it there. That was a great post on Gulliver's Travels Beyond the Moon. I just finished watching it myself, thanks to internet downloading. I only discovered the classic Toei Animation features because of their famous creators - Hayao Miyazaki and Isao Takahata of Studio Ghibli fame. This movie is remembered today because of Miyazaki, who was responsible for the girl-trapped-in-robot ending. It was only his second movie, and he was still a lowly in-betweener. This movie is really great fun, better than I expected. The only DVD version that I'm aware of is from Japan, and hopefully it isn't out of print. Only the Japanese soundtrack is available, unfortunately, and no English subtitles or soundtrack. Ah, well. Thank goodness for the internet, that's all I have to say. Reminds me I now have a copy of that OST LP too! I'll have to dig it up someday if I want to impress friends with MP3's of those tunes! Thanks Chris Sobieniak. I vaguely remembered this from my childhood and was curious to watch it again. I downloaded it and it works. Thanks Dave, glad it worked for you, and it's probably the best way to see it in this fashion too! I saw the film during an American theatrical rerelease when I was around three or four years old (I'm 52 now), and it was the first movie I ever saw in a theater. Needless to say, it left quite an impression on me and after seeing it I sought out every early anime I could find. I never saw it again until finding that faded pan-and-scan print that made it to DVD a while back with the Fleischer Gulliver's Travels, and I'd still love to get my hands on a widescreen subtitled DVD of it. No such American release exists, although a great subtitled print of it is on YouTube.